Xorigin is the duo of Johannes Stole (vocals) and Daniel Palmqvist (guitar), friends since their time at Musicians Institute in LA. Their debut album State of the Art offers a smooth platter of AOR melodic, leaning easily to the Westcoast sound as well. That latter feeling shows up early and clearly on the likes of Crying for You and In the Blink of an Eye, and later on The One for Me as a lighter motif leads often to a soaring finish in guitar solo. But, Xorigin can rock as well. The opener Can't Keep Running or the later Gina offer some big riffs and a bit heavier sound. Most everything on State of the Art is made bright by lively but never oppressive or overwhelming keyboard additions. Typical of the AOR Westcoast style is the lyrical theme of love and love lost. The disc rounds out with two melodic rockers, Matters to the Heart and What Love Is All About, and one ballad Mend My Heart which reflect that theme. Yet the strength of State of the Art is the strong and soaring vocal arrangements; everything else seems there only to bolster this important feature. The weakness here is that this is merely Eighties AOR melodic rock revisited once more. This is a certain product of Frontiers Records, especially this month with additional artists Airrace, Work of Art, and Toby Hitchcock. But, thankfully, that's still a very good thing. When melody and rock are merged once again, it's a welcome divergence, especially against the harshness of much of modern rock. If you're wanting something smooth and light, yet with a rock edge, look no farther than Xorigin's State of the Art. They do AOR and Westcoast melodic rock in a grand style. Also, another nod to the creative cover art. 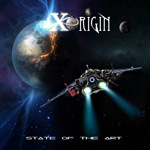 If you're wanting something smooth and light, yet with a rock edge, the venue of AOR, melodic rock, and the Westcoast sound, then look no farther than Xorigin's State of the Art.